Stay off the highways and byways everyone, as that perilous petrolhead with the most fascinating/ridiculous motoring wardrobe is hurtling our collective way this Spring 2018, courtesy of Dale Bowen. 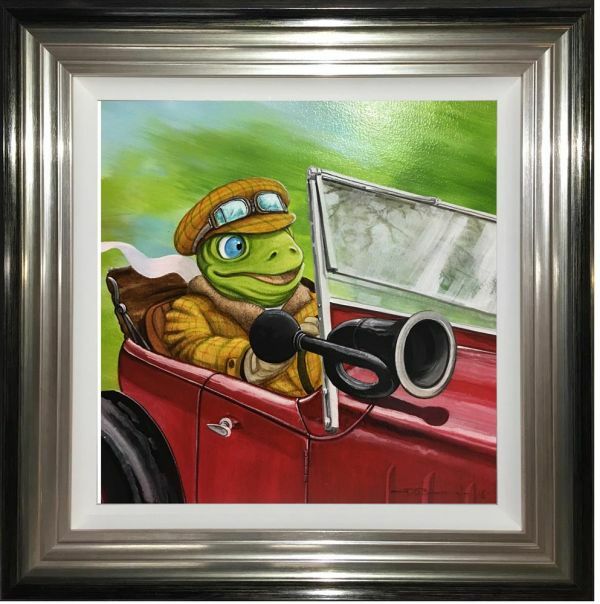 Whilst the sight and sound of the acclaimed contemporary fine artist, Bowen returning to take up where he pictorially left off is music to our ears, it’s arguable that the vision of the law-un-abiding Mr Toad will be to everyone’s liking. Still, there’s never a dull moment in Toad’s company, a point never better illustrated than here in the cut and thrust of Bowen’s much anticipated new original art reveal. It might only measure some 14” squared, yet small things often come in explosively graphic packages, and when Toad of Toad Hall homes into view on our horizons, a riot is always predicted. As ever, speak to us today for more details.